San Francisco, Calif., June 20, 2016 – The International Serious Play Competition announced its 2016 winners and honored SweetRush Inc. and its client Bridgestone Americas, Inc., with a silver award in the Corporate category. 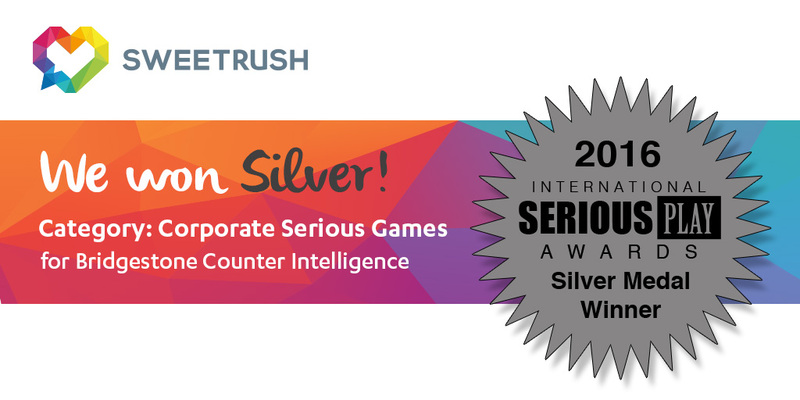 The winning entry was Counter Intelligence, a sophisticated, scenario-based, serious game available for desktop and mobile that SweetRush developed in collaboration with Bridgestone. The game serves as the culmination of a sales and product knowledge learning program and challenges sales associates to use all the skills they’ve acquired in the program. The International Serious Play Competition recognizes outstanding examples of titles that deliver a high quality of engagement and learning opportunities for students, employees, or other education or training situations. For more information, go to http://seriousplayconf.com/2016-serious-play-awards/.